As most of you know, The Book Thief is one of my favorite books of all time. I can’t get enough of it and I will always think that Markus Zusak is a genius for it. He’s a beautiful writer who knew exactly how to craft his story. I tried reading I Am Messenger and couldn’t get into it. It just didn’t work out for me. But, when I saw that he was writing this, I got a bit excited because it sounded pretty good. When I finally got my hands on a copy, I was intrigued and enjoyed the writing. But the further I got into the story, the more I realized that this book has a major fault to it. Each section focuses on a new character and their life story… all while this is supposedly about five Dunbar boys, especially Clay. Their mother died. Their father left them, only to suddenly come back again to try to get back in their lives. But the story meandered and had no focus. It talked about their mother’s history. Their father’s history. Then some random stuff. Nothing really happened. There was so much past and history that the story never really started. 75% in and it was all exposition that could have been summarized. I can honestly say that I didn’t hate this book, but it bored me half the death because there was nothing happening. I set it down for a few days and completely forgot what had happened and who everyone was. I had just forgotten. And that is why I really think that Markus Zusak is a one-hit wonder for me. Nothing will ever truly live up to The Book Thief, yet he tries to make everything like it. To be a pale comparison of his own style. It’s a damned shame, but I really think it’s true. This will probably be the last book of his that I try reading. 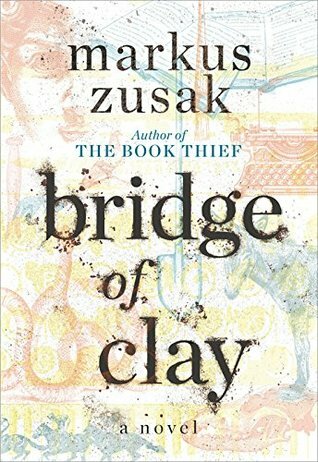 Do you agree with me about Zusak? Ah man, sorry to hear that this one disappoints. I loved The Book Thief and was ambivalent to I Am the Messanger but had high hopes for this one. Having no story is definitely a problem for a book to have, haha. Trust me, I wish I had enjoyed it more, too! I hope that you enjoy this if you decide to try it. I’ve seen lots of glowing reviews for it.